Home » Our Doctors » George K. Johnson, O.D., P.C. George K. Johnson, O.D., P.C. There are followers and there are leaders and in optometry, Dr. George Johnson is a leader. Dr. Johnson has always believed in being an early adopter of new eye care technologies to better serve his patients. He has been adding new diagnostic instruments to his practice even when other offices were not. This leadership paid off when using one of his advanced instruments he discovered a problem with a patient’s side vision that indicated either a brain tumor or aneurysm in the brain. Dr. Johnson immediately referred the patient to a specialist who in fact discovered an aneurysm (weakness of a blood vessel). The patient could have easily died if the blood vessel had ruptured. The patient had surgery to repair the blood vessel and all was well. Dr. Johnson encourages all his patients to get annual eye examinations. The patient who had a brain aneurysm simply made an appointment for his annual eye examination without having any symptoms of a vision problem. The patient expected a very routine visit. The eye examination with the new instrument probably saved his life. Dr. Johnson has been in practice for over 33 years. He is a graduate of Arizona State University and then went on to complete his Doctor of Optometry at the Southern California College of Optometry in Fullerton, CA. 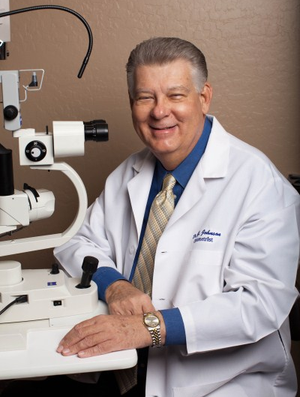 Dr. Johnson has been honored many times throughout his career including numerous President Awards from the Arizona Optometric Association and was named Optometrist of the year in 1990 and 1996. In 2004, Dr. Johnson was honored by Southern California College of Optometry as one of the top 100 individuals whose contributions, leadership or influence have nurtured and sustained the growth of the college since its inception 100 years ago. Dr. Johnson treats all family members and prides himself on his family oriented practice. He places great emphases on contact lens fittings, especially those difficult to fit contact lenses used to treat certain eye diseases. When not serving the eye care needs of his patients in the greater Phoenix, Arizona area, you can find him with his family, at a D-Backs baseball game, fishing, traveling, and target shooting. Dr. Johnson gives generously of his time to his community by participating in Save-Your-Vision Week and Vision USA. 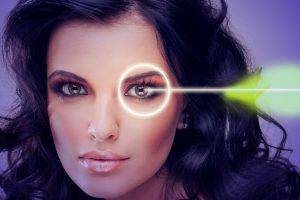 He has also organized numerous vision and eye health screenings throughout Arizona. You might also see him giving presentation on eye care at any one of the local high schools.